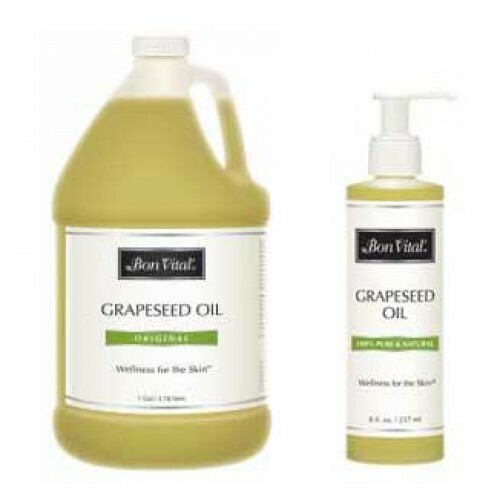 Grapeseed Oil, by Bon Vital, is an essential oil that has soothing, skin care qualities. This oil can be used by itself as a skin treatment or blended with any of the Bon Vital Massage Oils for added benefits. Grapseed essential oils are great for skin health, because it has been shown to repair damaged skin cells, thus having very positive effects on your skin health. Grapeseed Oil is a wonderful addition to any Massage Product, because the natural balance of vitamins and essential fatty acids promote Skin Care and help to tone and nourish the skin. The lightweight, smooth material is easily absorbed by the skin, so that it won't leave any residue. Grapeseed oil is gentle on the skin and allows uninterrupted gliding during application. Bon Vital essential oils are uniquely designed for a silky, smooth texture that benefits the skin. is this grapeseed oil pure or organic? The manufacturer states this item is made with organic/pure materials. I am a license massage therapy and this massage oil is my favorite one, it has a very nice glide, no smell. ( I also use it with combination of Lavender oil for client that prefer smell ) the price is unbeatable. Highly recomended. The grape seed oil is great stuff. I shave my legs with it and it makes my skin feel rejuvenated and refreshed.